Google has once again added more options for inserting images into a Google Doc. And of all times it actually happened while I was in the middle of writing a help guide about inserting images! I think I may need to give up on ever creating a handout that is correct for more than a few weeks. Anyway, we now have two great new options for inserting images. As usual begin by clicking "Insert" and then "Image..."
The first new option allows you to take a picture with your webcam. Just click "Take a snapshot" and grant Adobe Flash access rights to your webcam. 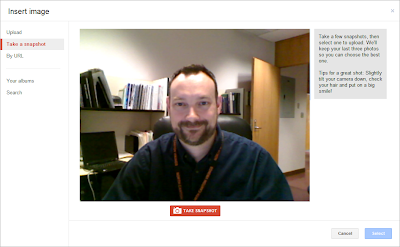 You will now see whatever your webcam sees and can click the "Take Snapshot" button. Docs will hold onto the last three snapshots you take so you can pick the best one to insert. I love this option because it moves us one more step into the cloud. Without the need for a special program, or the need to download an image to a hard drive, then upload later, a snapshot can now be taken and inserted with nothing but your browser. 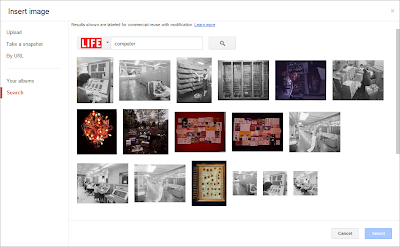 The second new feature is the ability to search for and insert images from Life Magazine. When you click on "Search" you now have Google images, stock images, and Life magazine combined in one place. You will get the option to search for images from the regular Google image search (just like before) and from stock images (just like before), but now you can also search Life Magazine photos. Again this is a great feature as it can connect users with high quality, relevant images, while cutting out extra steps to get the image from the web to the document.